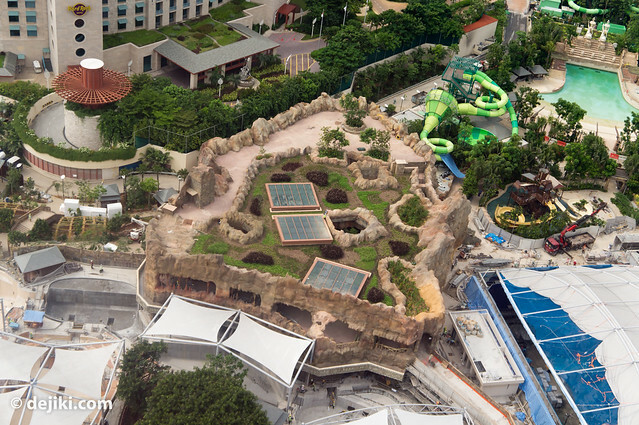 Now that Universal Studios Singapore is more or less complete, let’s take a look at Marine Life Park. 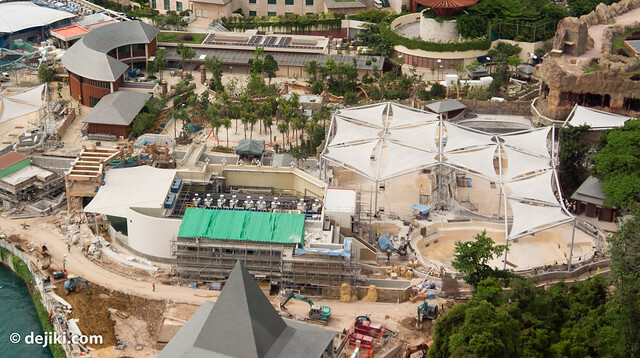 Featured in this update: Aerial photos of the park under construction. 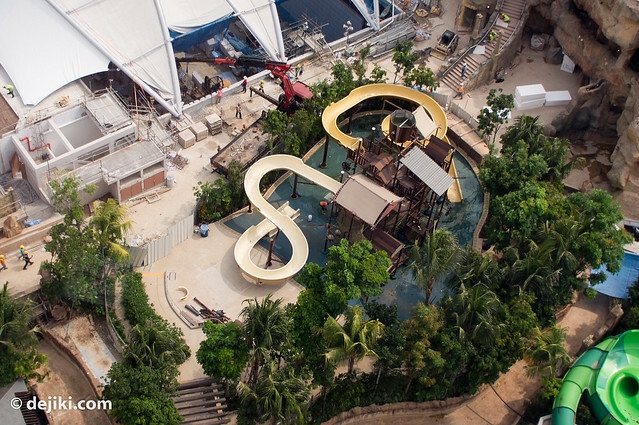 Previously known as Equarius Water Park, Marine Life Park is set to be the world’s largest Oceanarium and offers thrilling and fun water rides. 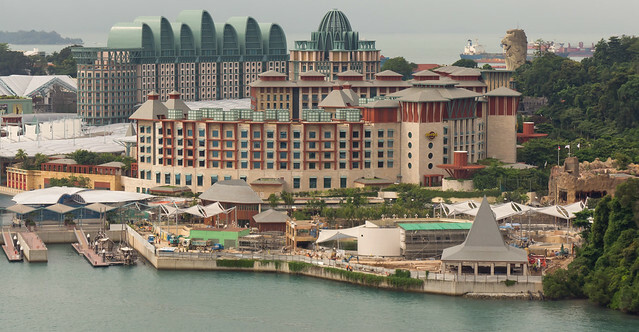 Resorts World Sentosa has announced that the park to offer multi-sensory experiences, blending marine life exhibits with exhilarating attractions to nurture interest and appreciation for marine life. 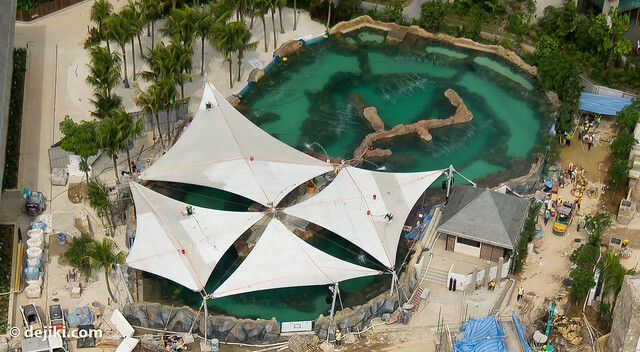 The park is building aquariums, a reef swim attraction and a (still controversial) dolphin experience attraction. Over 100,000 marine fauna will be housed in massive aquariums. 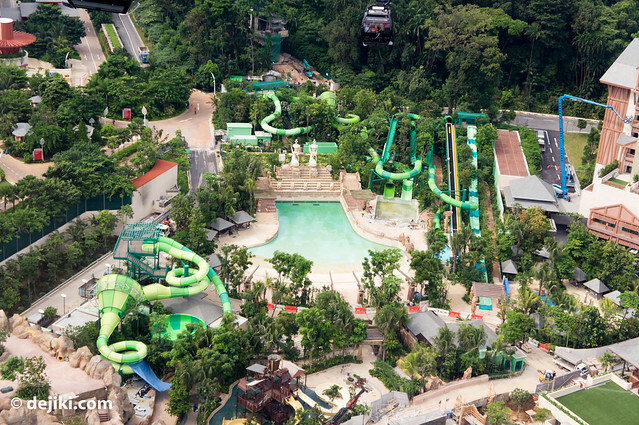 For the thrill seekers, Marine Life Park offers a 620m-long Adventure River, which flows around most parts of the park and through an underground grotto. 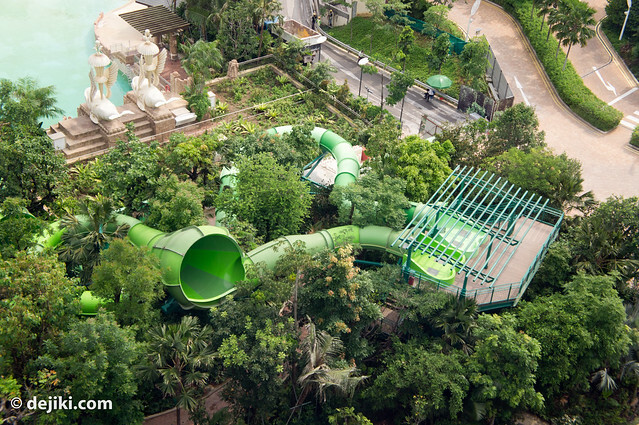 The west end of the park offers a variety of exciting water slide rides and a wave pool. The park is said to be committed to marine life research and ocean conservation, partnering with academic institutions and marine animal facilities. 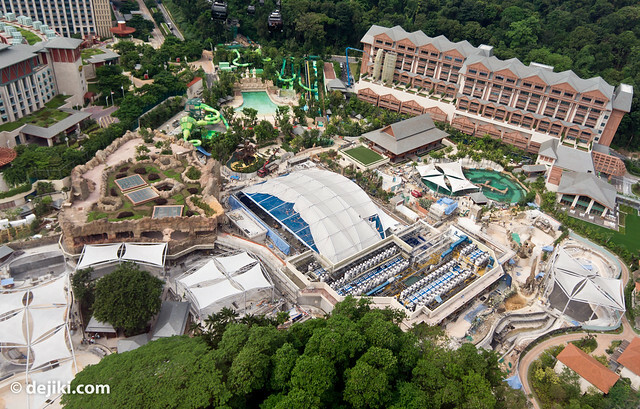 It is not a very big park – at about 19.8 acres (Universal Studios Singapore spans 49 acres), but just like the Studios, Marine Life Park looks jam-packed with attractions, maximizing all available space. The West end of the park (let’s call it “Equarius Side” for now). The East end of the park (“Waterfront side”, for now). The C-shaped building at the top-right corner, given its position and height, looks like a possible entrance to the park. 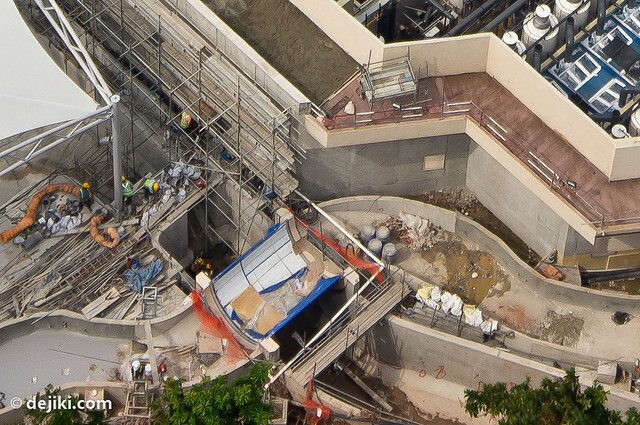 What appears to be a tank here with glass walls, so Adventure River riders can stop for a look. Interesting theming here: Turtles topping off the structure, and some curved poles lining the sides of the Adventure river. A handful of pools of varying depths here. Could the deepest one be for Dolphins? I can’t say for sure, but I’m definitely expecting activists to be very against any type/size of pools. 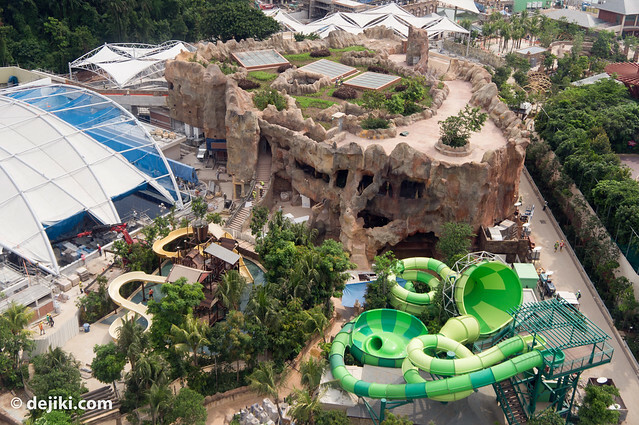 This is the multi-level “Rock” building which the Adventure River flows into. It houses the “underground grotto”. Over at the “Equarius Side”, there’s a wide and deep pool here on the right side. This is linked to the other pools mentioned earlier, which links to the large tank shown in the next photo. Next to it is something strange with all those trees and rocks. It’s shaped like a shark tooth in the middle. This is the park’s largest tank. 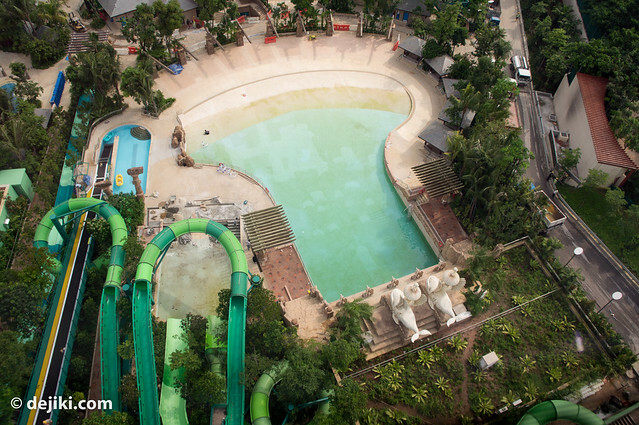 You can see how the Adventure River snakes around this area at the bottom of the photo. The Adventure River (higher one) crosses over the lower path: for sea creatures to swim to places. It looks like it could be some transparent half-pipe thing – for riders to see what’s happening below. This looks like the Reef Swim attraction. The Adventure River that goes near it looks very well themed. Just look at the details! 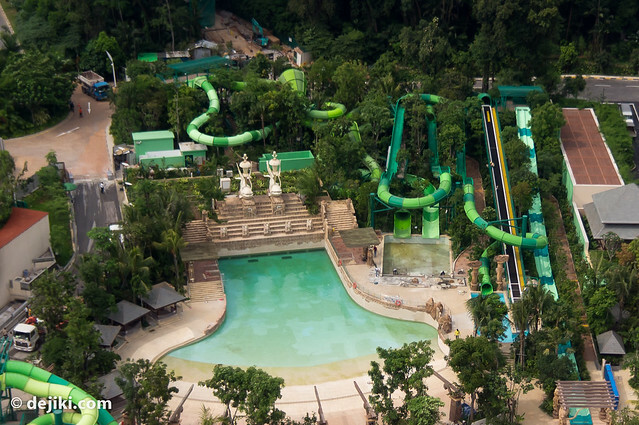 The 620m-long river takes on different themes throughout the ride, with this area being more Atlantis-like – pillars adorned with dramatic representations of marine life, such as lobsters, squids and more. The fun zone. Variety of slides here. 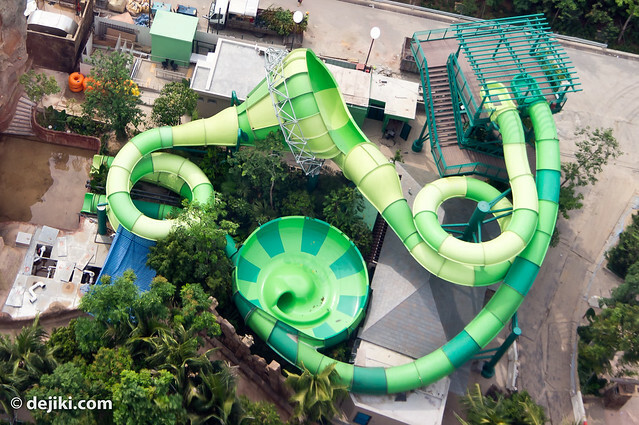 The shorter green slides – which doesn’t look too threatening. A more kids-friendly area that reminds me of the new Port of Lost Wonder attraction at the other side of Sentosa. Another look at the strange rock building. Nice to see that it’s fully themed around. A small wave pool. Definitely not for surfing but perhaps just to float around in it. 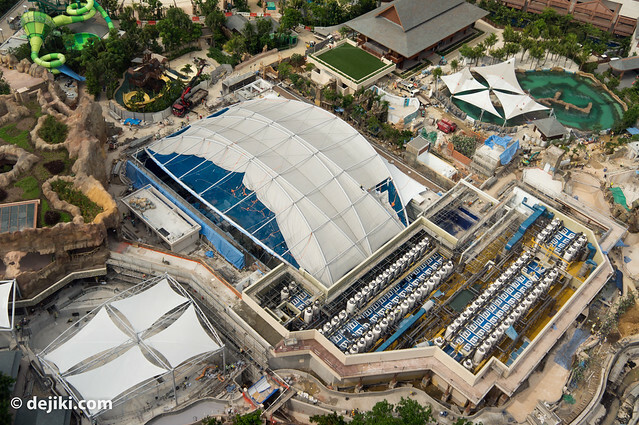 Another look at the wave pool. 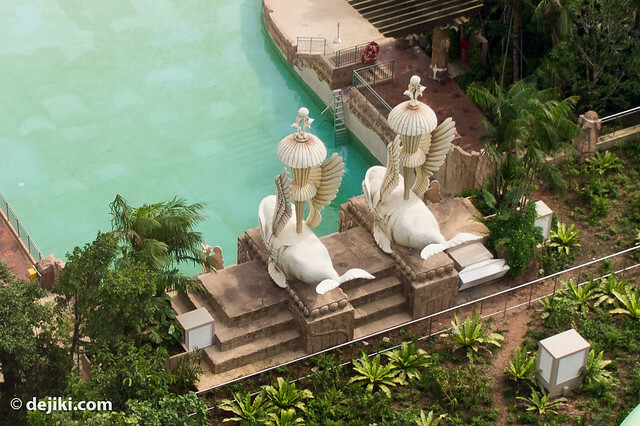 The statues here appears to be Whales, with wings, watching over the wave pool. Overall, it seems that the park has very extensive and detailed theming. As two hotels (Hard Rock Hotel and Equarius Hotel) overlook the park, the theming has to go all around (no plain walls hanging out). 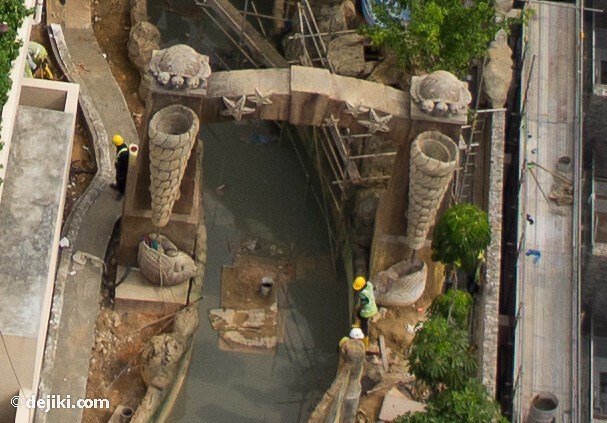 Sadly, it looks like the park will not be ready this summer, given how major construction works are still going on. The aquariums will take a while before the water can be put in and be ready for its inhabitants, and it’ll take even longer for its biodiversity to stabilize. 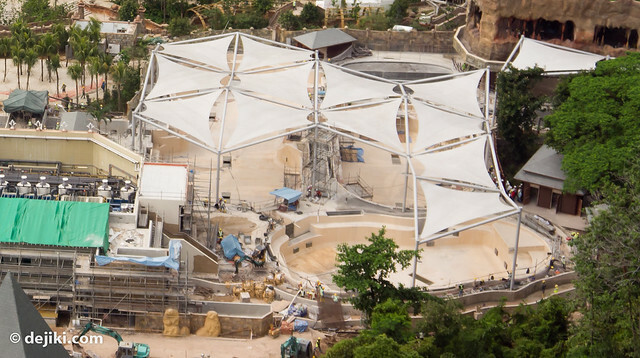 I’ll be posting monthly updates about the park’s construction, so do remember to subscribe for the latest updates! It’s nice to see that all these theming is well-done. Thanks! it was really nice meeting you on Tuesday.